When the Pharisee who had invited him saw [the immoral woman anointing Jesus], he said to himself, "If this man were a prophet, he would know what kind of woman is touching him. She's a sinner!" Then Jesus answered his thoughts. "Simon," he said to the Pharisee, "I have something to say to you." "Go ahead, Teacher," Simon replied. I love the way Luke describes this situation: "Jesus answered his thoughts." I'm sure I don't want Jesus answering my thoughts in front of a room full of important guests. I have some thoughts that aren't as righteous as I would like. I'm trying to "take captive every thought to make it obedient to Christ" (2 Corinthians 10:5 NIV) and let the Holy Spirit guide my thoughts as well as my words and behavior. Unfortunately, my intentions and my performance haven't become completely congruent. How about yours? Interestingly, if we are led by the Spirit, I believe Jesus does answer our thoughts. All too often we are not open to hearing his voice because it comes in forms less direct than the words this Pharisee is about to receive. 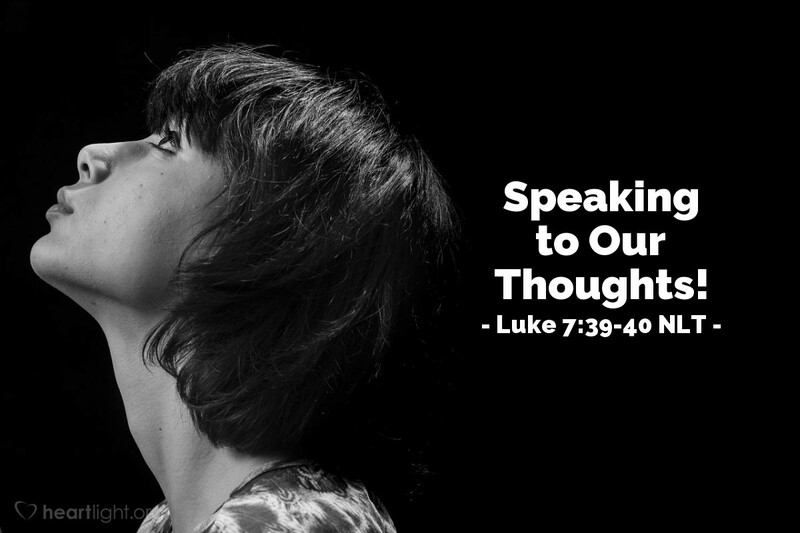 Jesus can answer our thoughts in the sermon message on Sunday, often by stray comments that are not centered on the main topic of the message. Jesus can answer our thoughts through the books we read, songs we hear, conversations we have, and our meditations that occur with the prayers that we offer. Sometimes it takes a boatload of the messages to get through to us, but the messages are there if we are listening. So often we segregate, insulate, and compartmentalize our lives so that we expect holy messages only during "holy times" — our quiet times, our church experiences, our retreats with other Christians, etc. However, if we begin each day with a purpose to walk with the Lord led by the Holy Spirit, then God is shaping us through the events, conversations, and messages we receive and our reactions to them. Jesus still knows our thoughts! He still speaks to them through his word and also through his Spirit. Let's tear down the wall between the secular and the sacred and let Jesus be Lord of all of life. Then, let's begin each day with the words of Simon, "Go ahead, Teacher." O precious and majestic Father, God of all the universe and my Abba Father, awaken my mind and open my heart to hear all that you are seeking to say to me through your word, through your world, and through your people. Shape me and mold me as I seek to guard my heart from what is false and contaminating input, and open my heart to your messages in my everyday life. In Jesus' name, I pray. Amen.